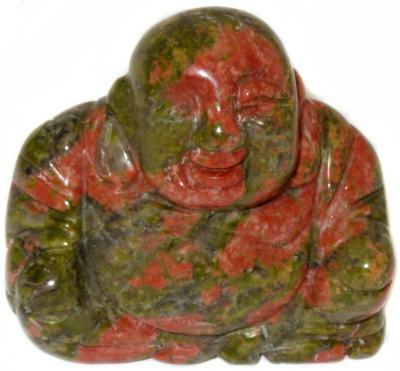 Happy Buddha carving in colorful Unakite. Unakite is a crystallized form of pink Feldspar, green Epidote and Quartz. It is said to clear blockages to physical and personal growth and speed development of one's goals. This gentle healing stone stabilizes the physical, mental and spiritual energies, just as it is itself, a stable triad of Feldspar, Quartz and Epidote and their properties. Unakite allows a slow "rebirth" and release of difficult past conditions which have been feared or resisted by facilitating a steady, smooth transition away from harsh memories and experience. Unakite has been used in association with fertility and pregnancy to clear blockages and stabilize growth.